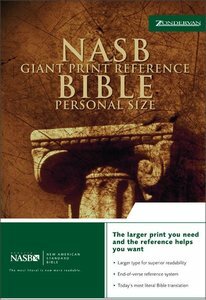 About "NASB Updated Giant Print Reference Burgundy Personal Size"
An easy-to-read giant print edition of the popular, word-for-word, literal Updated New American Standard Bible. Centre-column references, colour maps, and more. - Center-Column Reference System-with references based on key words, phrases, and concepts. - Large Print-clear, readable type. - Two-Column Text in Paragraph Format-for easy reading and comprehension. - Full-Color Maps, Study Helps, Book Introductions, and Concordance. - Words of Christ in Red.